The expansive model train layouts and various botanical gardens make Wandering Tree Estate a unique wonderland that feels like walking through a dream. Incredible care and extreme attention to detail can be found at each and every turn. 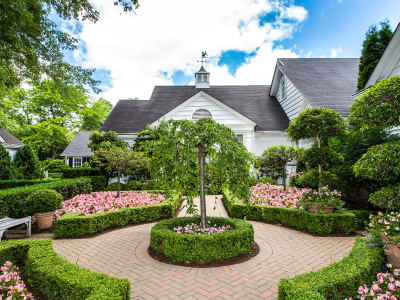 Wandering Tree Estate’s owner, Elaine Silets, has dedicated her life to the gardens and model railroad layouts on the estate so that you can have a truly unforgettable experience. Elaine has risen to fame within the model railroading community for her jaw-dropping model train layouts. Wandering Tree Estate is the proud home of two very large and elaborate model railroad layouts. 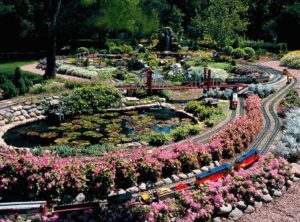 The outdoor layout, known as The Gloree and Triumphant Garden Railway, runs on over 10,000 square feet of land. These large G-scale trains pass through bridges, over waterfalls, and past model vignettes, each holding their own little story. You and your guests will be saying “WOW!” throughout the day. After your guests are astounded by The Gloree and Triumphant Garden Railway it will be time to head inside into the Harvey Silets Memorial Chicago Model Railroad Museum. If your guests thought the outdoor model railroad was amazing they are in for a big surprise. 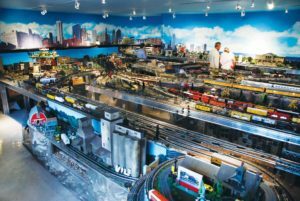 The indoor train museum has O-scale trains that run through a replica of the City of Chicago. You can expect to find Union Station, a drive-in theater, the Chicago Skyline, the underground L subway system, Millennium Park including Buckingham Fountain, a hidden missile silo, and so much more! Kids and adults will love interacting with the vignettes and watch the live video feed from cameras mounted on the trains. 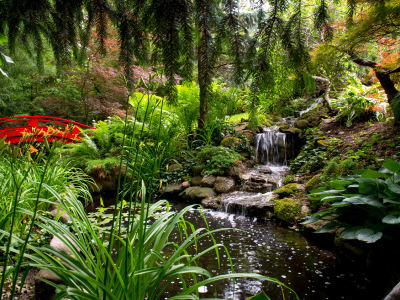 Wandering Tree Estate features 10-acres of elegantly designed botanical gardens.